Do you plan on proposing this Valentine’s Day? Gift the love of your life a diamond engagement ring she will cherish for an eternity. Today’s Valentine’s Day Diamond Sale choices include the Romantic Cushion Cut diamond, the Refined Round Brilliant diamond, and the Regal Oval Brilliant Cut Diamond. No other diamond shape radiates romance more than the curvy cushion cut diamond. This royal shape is reminiscent of fantasy, combined with an elegant, traditional feel. This shape has been in style for over two centuries, and is gaining tremendous popularity with women across the country in 2016. The 2.36 Cushion Cut Diamond is ideal for the woman who wants a beautiful diamond with impressive size. Its top-tier F color, and desirable SI1 clarity will sparkle her eyes. All while still knowing you’ve saved thousands of dollars choosing a 2+ carat gorgeous, natural, clarity enhanced diamond. The Round Brilliant Diamond is ideal for the woman who appreciates classic beauty, as one would find in an elegant, simple, black cocktail dress. The circular shape of the diamond symbolizes that love has no beginning, and no end. The Round Brilliant is historically the most popular shape for engagement rings and offers the highest amount of sparkle and brilliance. The 2.09 carat Round Brilliant Diamond is perfect for the woman who wants a sparkling 2+ carat diamond for under $6,500. Its faces up a white G color, and eye-clean SI2 clarity. This diamond has been laser drilled to improve the appearance of clarity, and boasts high levels of fire and sparkle. For the graceful woman who wants the romance of a cushion, tradition of the round, and size that will make her sparkle from across the room! The Oval Brilliant Cut diamond is a desirable shape for the woman who wants the sparkle and class of a round brilliant, and the romantic curves a cushion shape has to offer. Its elongated shape often allows this shape to appear larger than its actual carat weight. Celebrity Blake Lively has been known to flaunt a large Oval Brilliant Diamond Engagement Ring. The 4.04 carat Oval Brilliant Diamond has it all while still coming in at a reasonably priced diamond for its size. It flaunts a GIA Certified white G color, and exceptionally eye-clean VS1 clarity. 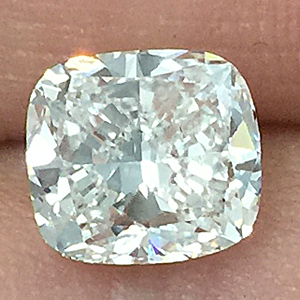 This diamond is a natural, GIA Certified, HPHT Diamond. *Diamond Sale prices valid through January 14, 2016. Reserve today, with deposit, to hold prices.